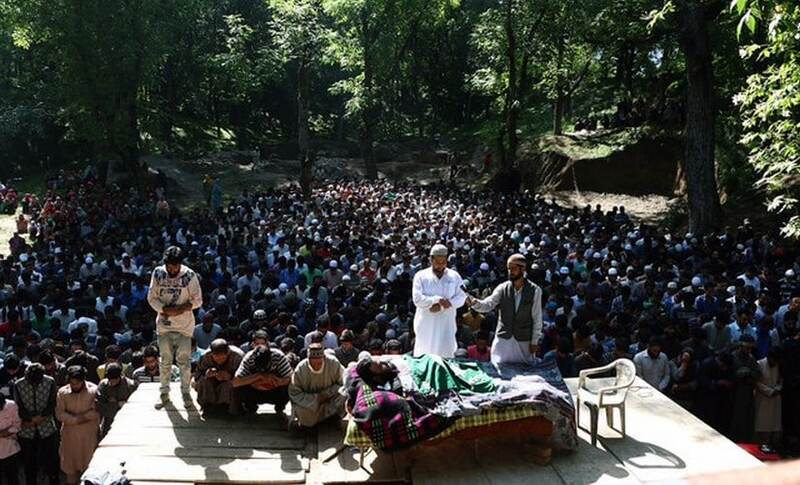 Thousands of people attended the funeral prayers of militant commander Sabzar Ahmad Bhat that took place on Sunday which was also the first day of the holy month of Ramadan. Bhat was killed in an encounter on Saturday in his native village of Ratsuna in Tral area. The mourners chanted anti-India and pro-freedom slogans while the dead body of the slain Hibzul Mujhaideen commander was being carried on the shoulders, angry young men fought with each other over who will carry the dead body for the funeral prayers. An unidentified bearded militant in his early twenties, wearing a thin black jacket, a rucksack and a grenade in his left hand, suddenly appeared in the crowd, and led the sloganeering. He vowed to revenge the killing of his fallen comrade. He too was carried on the shoulders by the people till he reached the spot were Sabzar’s last prayers were offered. "I want to tell you here today," the militant cried out loud, "he (Bhat) laid down his life for a just cause," as he raised his finger in the air. The crowds cheered and raised their fists in affirmation. "You have to be part of this movement, you have to support us till we get you out of the clutches of tyranny and oppression," he added. Despite a strict curfew in the entire south Kashmir, thousands of people gathered to pay their last respect to the slain militant commander (Bhat). The streets leading to the native village of Sabzar, Ratsuna, were deserted as the state government, to avoid a large congregation of the people at the funeral, deployed thousands of forces and restricted the movement of people. But hundreds of them left their homes pre-dawn to attend his funeral prayers. "We left our home after having (sehri) and crossed dozens of orchards before reaching this village. 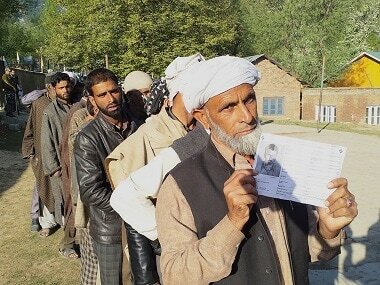 Had we tried the road we would have been at the police station," Imtiyaz Mir, a resident of Kakapora, told Firstpost. "But despite the restrictions so many people turned out. It shows how popular he was," he added. Outside the village and on the National Highway 1A that connects Kashmir with the rest of India, a heavy deployment of troops maintained an enforced peace. The young children tried to engage the forces with stone pelting but were overpowered by the heavy deployment of forces. "How many people have died there with the militant," an elderly man Razak Ahmad Sofi, who was working in the saffron fields near Pampore town asked. “Children used to give news from their mobile phones, now even they have stopped working," he explained. The state government, anticipating large-scale protests on the streets, snapped Internet services and shutdown pre-paid mobile phones. 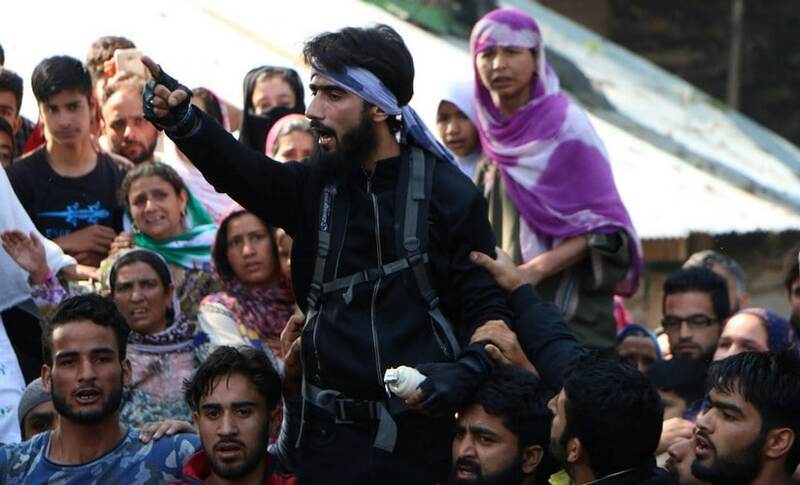 Soon after he was killed, the death of the militant commander spread on the social media, which had started working after a month in Kashmir on Friday evening. 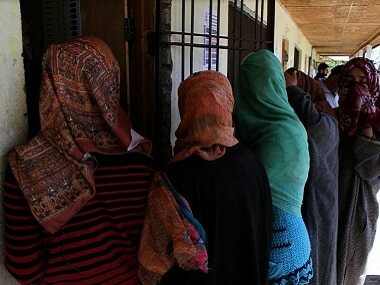 The streets of Kashmir wore a deserted look on Sunday as the Valley stared at the possibility of another unrest. Now with the start of Ramadan, there is likely to be an escalation in violence in the coming days. The killing of Sabzar and his teenage friend Faizan Muzaffar who joined the militancy at the age of 17, was the last thing the PDP-BJP government ruling the state of Jammu and Kashmir wanted since the protests were slowly ebbing and a semblance of normalcy was returning to the Valley. The footfall of tourists had steadily increased in recent weeks in Srinagar and a vulnerable state government was hoping for a peaceful summer after an unrest last year that left close to hundred people dead. The unrest had begun after the killing of former Hizbul Mujahideen commander Burhan Wani, also a friend and close confidante of Sabzar. Since Saturday (after the killing of Bhat), dozens of people have been injured in protests and clashes that broke out in both north and south Kashmir. It is a symbolism of how peace has remained fragile in the Valley, so much that even the death of militant can bring the entire Valley to a halt. Kashmir is observing complete shutdown in the wake of a two-day shutdown call given by the joint separatist camp over the killing of Bhat and Muzaffar. All the roads remained deserted while shops and other business establishments remained shut across the Valley. 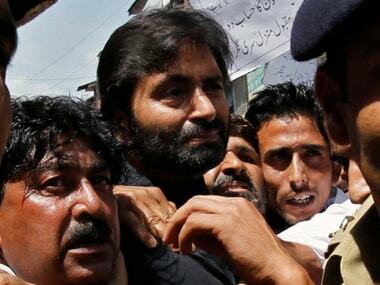 Earlier, Kashmir police arrested Jammu and Kashmir Liberation Front (JKLF) chairman Mohammad Yasin Malik from his Maisuma residence in Srinagar. On Saturday, Malik had reached Tral and paid homage to the two militants killed in the encounter in Saimu village of Tral. “We are not even allowed to mourn the death of our martyrs," Yasin told reporters outside his residence. 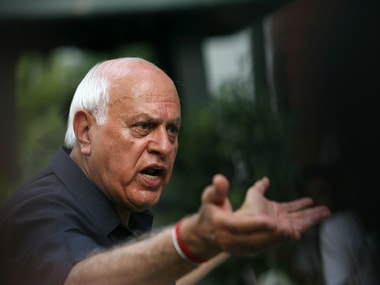 "Forces have been given free hand to kill innocent Kashmiris," he said. Authorities have limited the movement of Hurriyat leader Mirwaiz Umer Farooq, and Syed Ali Shah Geelani has been put under house arrest. 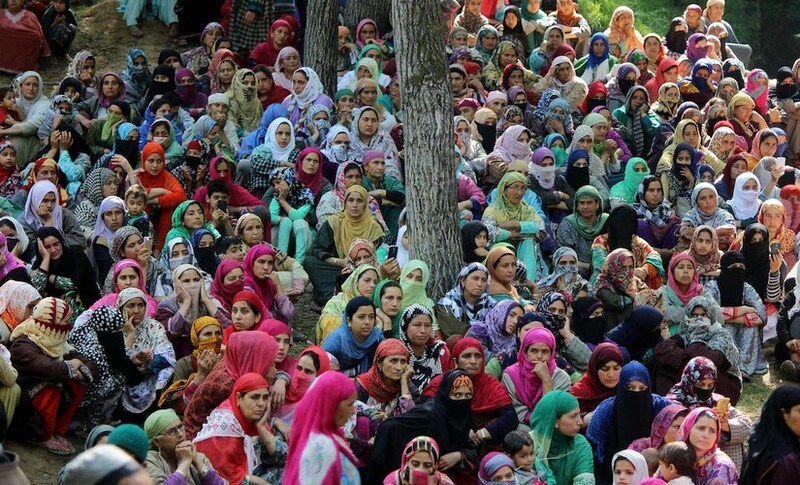 A united Hurriyat Conference has called for a two-day strike against the Saturday events. The Kashmir police said in a statement that stone pelting incidents were reported from about two dozen places in the Valley. "The gatherings of miscreants pelted stones on police establishments and forces camps,” the spokesman said. “They also pelted stones on moving vehicles on the busy roads and in the chowks." It is further ordered that all the colleges and higher secondary schools in Srinagar will also remain closed on 29 May, and authorities at the Kashmir University on Sunday announced that they are rescheduling all examinations scheduled on 29 and 30 May. 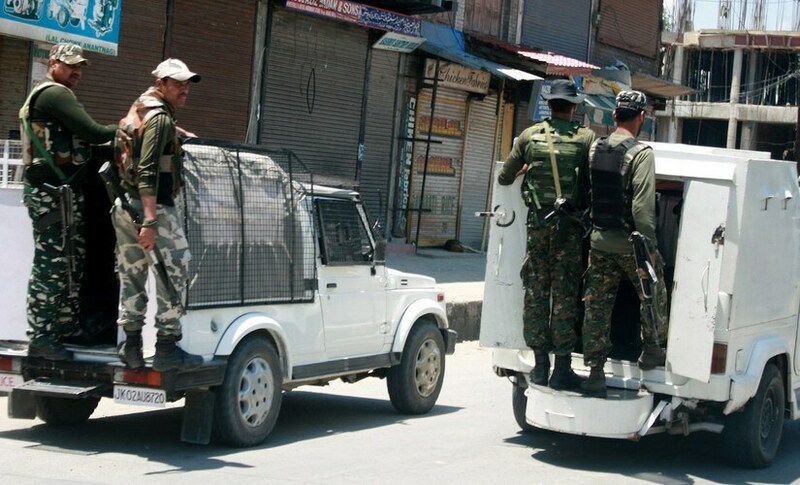 Kashmir’s Inspector General of police, Muneer Khan, said that the situation was "under control" throughout the day, and restrictions were imposed in jurisdictions of seven police stations in Srinagar and in the districts to maintain law and order. “Police exercised maximum restraint while dealing with stone pelters. One person was in critical condition yesterday, but today his condition had improved in the hospital and he is out of danger,” he said.